"I have been to six other chiropractic facilities over the last 20 years. Never have I been to one who has been so caring, thorough and concerned as this one. I appreciate the explanations to my questions when I have them. What a nice experience -- at last!" "Before I started coming to Midlands Health Center I would often wake up in pain, which I thought was normal because I thought I may have been just `sleeping bad` or in a wrong position. After my initial visit I realized it was much more than that and I realized it needed to be treated. Since I have been coming I have not had nearly as much pain and have seen great improvement. The staff here is awesome and always attentive. I enjoy coming here and also look forward to continuing my treatment." "Since coming to Midlands Health Center I seldom use my cane that I used almost every day. I have been helped very much and intend to keep up my wellness plan." "When I first started coming in, I was having head aches. That has all gone away. I am sleeping better, standing up straighter and overall feeling much better. I attribute this improvement to the care I received at Midlands Health Center." "I have been able to benefit from the wonderful chiropractic therapy. My job is somewhat stressful and I find myself having bad neck and back pain frequently. Since I have been coming here and getting my trigger points done (excellent) and adjustments, I feel that my condition is much better. I also feel better overall." "I have been given a new lease on life. I can now be a part of my family again. My only regret is that I did not know about this years ago." "Before I started care, I was unable to sleep at nights and after a few treatments I have been able to get a good night sleep. Co-workers notice that I am much happier and energetic. My medical doctor recommended an aggressive medical treatment but I decided to try the preventive care instead. I am very pleased to say I made the right decision." "Before I started my care plan I was having migraines three to four days a week. Since I started the plan I have had literally one or maybe two in four months. It`s truly miraculous. My other doctors had tried medications, cortisone injections, and orthodontic work. Nothing worked. Now I don`t need any of it. I`ve stopped all the medication. I`m not tired all the time. I feel like a new person." "I was skeptical when I first started treatments but my attitude is completely different now. They did what they said they could do for my problems and I have seen a dramatic improvement. My migraines are less frequent and I`m sleeping so much better. The nicest part is that I leave here feeling so much better and with lifted spirits. The staff is wonderful and they made me part of their 'family'!" 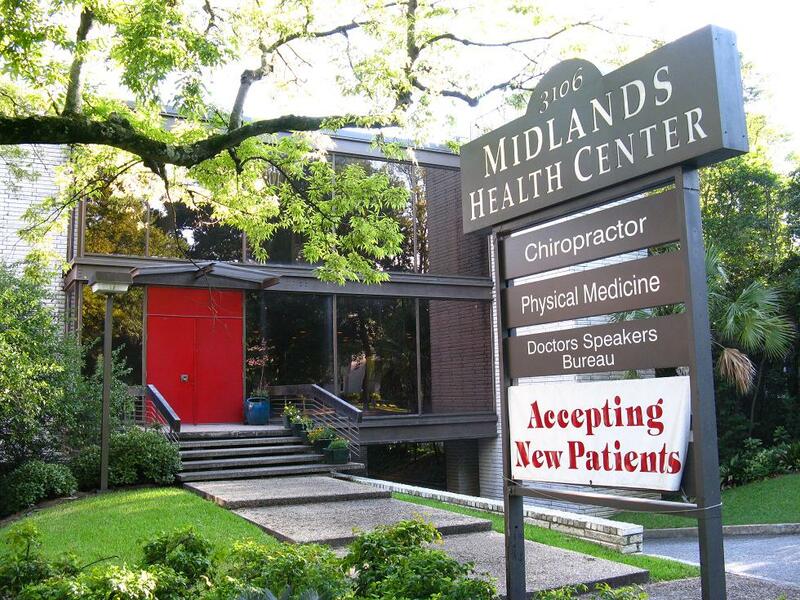 "Before coming to Midlands Health Center, I did not believe in chiropractic care. Before I started my care, I had lower back and hip pain that was 24/7. I had been to four different doctors and no one could seem to help me. All they could do was prescribe prescription drugs for the pain. I was on four different prescription pain pills at the same time and I was still in pain. On a scale of 1-10, my pain was a 10 plus. By the time I first saw Dr. Jones, I could barely walk, even with a cane, and I was so severely depressed that I lost more than 30 pounds and I could sleep no more than two hours a night before I would wake up in severe pain. Chiropractic treatments have helped me tremendously. Since I began my care, I am no longer taking all those prescription drugs. My pain level is down to a three. I would like to thank Dr. Jones and his wonderful staff for all they have done for me and my health. May god bless each and every one of you." "When I first came to Midlands Health Center, I had gone for so long without treatment that the pain was controlling my everyday activities. After the first week of treatment I felt so much better and I couldn`t believe I had put my health on the back burner so long. I appreciate all that Dr. Jones and his staff have done for me." "I can truly say that Midlands Health Center and Dr. Jones have made a difference in my sense of smell. For years I could not smell but after one visit I could smell the food from the shop next door. I continue to have my sense of smell. Thank God for Dr. Jones and his staff. May God continue to bless you all." "I have only been a patient of Midlands Health Center for three months. When I came in I had terrible pain in my lower back, my neck was stiff every morning and my balance was off as if one foot was dragging at times tripping on the sidewalk or on level ground. Sooner than I thought, the neck roll I use at night helped with my neck pain, the trigger points helped my lower back pain and the adjustments were great. I used to sleep on my stomach, now I sleep on my back comfortably. It was suggested I purchase an orthopedic pillow. This also helped. Thanks to the great staff that has helped me feel great again!" "Ever since coming to Midlands Health Center I have experienced much less pain and much more flexibility in movement. Dr. Jones and his staff have been very helpful in meeting my needs and the therapy has greatly improved my health and well-being. I feel like a new person!" "I didn't realize how much my life could improve until I was referred by a friend to Midlands Health Center. My pain relief was almost immediate after the first two visits. I still have a way to go in my treatment but now I have the encouragement to finish my goal. Thanks for making my life better." "My family loves to come here. The staff is very professional and friendly. We all feel so much better. We have come to Dr. Jones for years and if we take a break from our visits it is not long before we have to come back for adjustments. Not only can we feel it in our backs but also have better overall health from digestive, sinus, etc." "Midlands Health Center is a great environment for someone to get well. The staff is extremely friendly and helpful. I am thankful for these people and the care they give me." "The care I`ve received from Midlands Health Center has made a huge difference in my life. The staff is great and they are genuinely interested in how I`m doing each time I am in the office for treatment." "When I first began having treatments, my knees were in bad shape and I had difficulty walking at times. Today, that`s no longer the case. I would say that my knees are about 98 percent of normal, without having to take medicine." "I have noticed a significant change in my pain level and mobility. I am feeling much stronger than before my treatments started. The office staff and doctor are all very professional and at the same time caring and kind. I would have never believed I could feel this much better." Midlands Health Center is a multidisciplinary healthcare practice, offering both medical and chiropractic care to our patients. The primary method of treatment is chiropractic adjustments. This is geared toward addressing the underlying cause of illness and dysfunction within the body - nerve interference caused by misalignments of the spine. When your body loses the ability to fully communicate through the nervous system you can no longer effectively coordinate all your body functions. This eventually presents as the physical symptoms that motivate people to initiate care with us. The chiropractic adjustment removes this interference so that you can become a healthier and fuller expression of life. As much as we want you to be out of pain, our big picture goal is for you to have a better quality of life. Your browser does not support inline frames, but you can download the form here. You can download the New Patient form here. Our forms require a PDF viewer, available free from Adobe Systems.